Fossils and dinosaur tracks have been found on the Isle of Wight for a considerable length of time but it was only when early Victorian scientists and amateur collectors started to analyse and discuss them that the world discovered what they were. Now TV cameramen are regular visitors, academics broadcast on radio and TV on the subject, and school children have discovered new projects for their summer holidays. Yesterday evening I became a child again as I waded along the shoreline at Brook Bay on the Isle of Wight searching for dinosaur remains or fossils, a rediscovery of the magic of the ‘other’. Excited children and adults queued up to show our guide the finds we had collected, stones that may have been fossils, shells that may have been ammonites, and odd fragments that could have been crocodile remains. Well, yes, could have been but were not, despite the fact that crocodile remains have been discovered here in the past. The walk of discovery was led by one of the most expert guides I’ve ever come across, who shepherded her party of 15 people across the shallow sands of the bay with cheerfulness and wit. Apart from Dinosaurs, the Island has a remarkable diversity spanning the whole of the Cretaceous period and the shingle foreshore at Brook Bay is one of the best places to find dinosaur fragments, especially after severe storms when more sections of the cliff walls are uncovered. There are around 15 species of dinosaur currently recognised on the Isle of Wight with more mysterious remains yet to be determined. Over 120 million years ago the environment on the Wight was just right to support a rich biodiversity, from the smallest bacteria and insects living in ferns, cycads and large conifers, to the giant dinosaurs and soaring pterosaurs, the large meat-eating dinosaurs like Neovenator and Baryonyx being at the top of the food-chain. A visit to Dinosaur Isle Britain's first purpose built dinosaur attraction where in a spectacularly shaped building reminiscent of a Pterosaur flying across the cretaceous skies you can walk back through fossilised time to the period of the dinosaurs 120 million years ago, whets the appetite: the contents consist of some 30,000 geological specimens, mainly fossils. Life sized models of the island’s famous five dinosaurs are set in amongst a recreated landscape – neovenator, eotrannus, iguanodon, hypsilophodon and polacanthus - while flying above you are pterodactyls. The Museum aims to be “a national centre of excellence in the conservation, interpretation and acquisition of the Island’s dinosaurs and diverse geological heritage” and its aims are to collect, document, preserve and facilitate research of geological material and to display and interpret the Island’s geological past with special reference to dinosaurs. All of this it is does to a remarkable extent while keeping the museum visitor-friendly to all. Find out more at http://www.visitisleofwight.co.uk/attractions/dinosaurs. And now comes a major new blockbuster Walking with Dinosaurs, a 3D Movie, set for global release in December 2013, from BBC Earth Films and Evergreen Films, presented by Twentieth Century Fox & Reliance Entertainment in association with IM Global, when for the first time in movie history, audiences will truly see and feel what it was like when dinosaurs ruled the Earth. The makers say that Walking With Dinosaurs: THE 3D MOVIE is set to be the ultimate immersive, big-screen, 3-D experience that due to recent discoveries and a breakthrough in technology will introduce new and unique dinosaurs that are more real than ever before. This, it is claimed, will put moviegoers in the middle of a thrilling prehistoric adventure, where an underdog dinosaur triumphs against all odds to become a hero for the ages. At the same time a new and exciting Dinosaur Island App Trail based on the ancestral links between the characters in the film and the island dinosaurs will be released which will give everyone the chance to be seen standing alongside dinosaurs in the very place they were discovered. The new app utilises technology which allows you to use smart phones and tablets to take pictures of family and friends walking alongside the dinosaurs that roamed the Isle of Wight 130 million years ago, while at the same time learning more about the dinosaur characters in the movie. The Augmented Reality App will be available to download from anywhere in the world, but will only be triggered into life at six coastal locations on the Isle of Wight. Once downloaded, open the Dinosaur Island app. Click on the “information tab” to map your current position and the location of the six meteorites on the Isle of Wight. 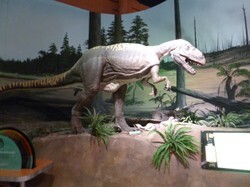 You’ll need to visit one of the meteorites to trigger your dinosaur encounter. At each meteorite location you will meet a different dinosaur. Click on the “question mark tab” to view a presentation of how the Dinosaur Island app works. You can take a picture of your family or friends walking with the dinosaur you encounter at each meteorite location and then save, email or share the image. Click on the “movie tab” to see a trailer for WALKING WITH DINOSAURS: THE 3D MOVIE due in cinemas this December. Please note! Your Dinosaur Island app can be downloaded from anywhere you can obtain a phone signal, but it will only show you a dinosaur when you are standing in front of one of the six special meteorites to be found on the Isle of Wight. This season has seen a big increase in visitors to the various sites on the island, and the Museum in Sadown has had increased ticket sales. It was a big help being named Dinosaur Island as you can imagine. Maritravel, Dinosaur fossils are so other-worldly that is such a thrill to walk in their footsteps or to touch their remains, bony though they may be. I hope that the archaeology is able to go forward thanks to the revenue influx from visitors. Funding is always an issue, but this designation could be quite helpful. Yep, and it's official from this year that it is to be known as The Disosaur Island. I didn't know the Isle of Wight was a dinosaur island - one more reason to visit! You'll be more than welcome on your return from Asia, John. Great article Mari, must try to visit the Isle of Wight when resettled. Thank you. Things are hotting up now on the Isle of Wight as they get ready for a big Dinosaur event next month. I can look forward to 'walking with dinosaurs' in the winter months when the shoreline reveals a different aspect. A very interesting trip for any dinosaur fan. Nice post!